Here’s a pictures of the Enchantment during its recent lenghtening process and below is the press release from Royal Caribbean. MIAMI, May 31, 2005 – Shipbuilding technology has come a long way since Royal Caribbean International lengthened its last ship 25 years ago. 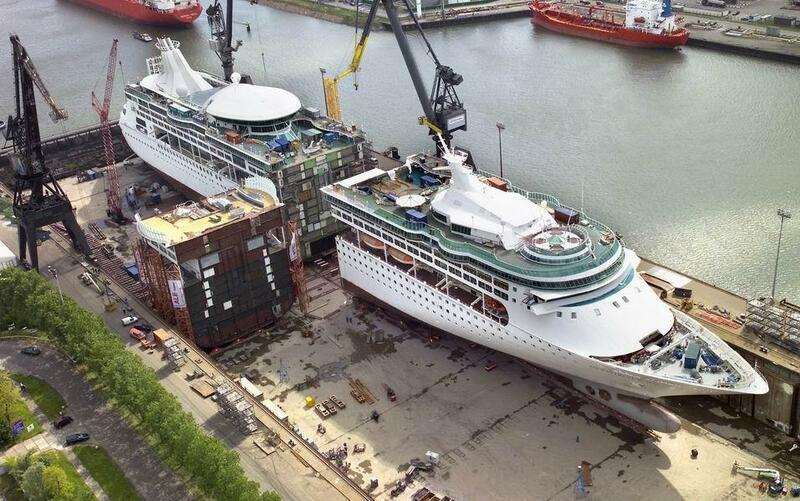 Royal Caribbean’s third ship to be extended, Enchantment of the Seas, lies in dry dock this month, where workmen are laboring round-the-clock to add a 22.2-meter (73-foot) midsection and other major innovations. What once took three months now takes one, and assembly is on dry land. “Aker Finnyards is proud to present this project as one more achievement during the 35-year cooperation with Royal Caribbean, including 14 delivered cruise vessel newbuildings and three lengthenings,” said Aker Finnyards President Yrjö Julin. Splitting the ship in two took workers six days to cut through more than 600 meters (1,969 linear feet) of steel with gas and oxygen torches and circular saws. Once they were severed, sections were moved into place with skids and hydraulic jacks, which were guided by a laser alignment system. The 10,265-metric-ton (11,315-ton) bow section slid first. The 2,666-metric-ton (2,939-ton) mid-body was then moved into alignment and pushed back toward the ship’s aft section. The bow section was then moved back into place. Several of Royal Caribbean’s signature features also are being added, borrowing from the line’s latest ships, including Boleros Latin lounge, Chops Grille steakhouse specialty restaurant and Latte’tudes coffee and ice cream shop, offering Seattle’s Best Coffee® and Ben & Jerry’s®. The Monitor. A blog for professional Marine Engineers in the commercial maritime world.